Maimi was back for the third week in a row on this past week’s episode of “HaroPuro! TIME”, continuing on her bicycle trip to Shizuoka’s Kunouzan Toshogu shrine to pray for the success of ℃-ute’s upcoming single, “Kimi wa Jitensha Watashi wa Densha de Kitaku” (You Ride Your Bicycle While I Catch the Train Home). The announcer recapped Maimi’s trip so far, noting her “super slow” pace of 3km/h (about 1.9mph) and the fact that she was heading north instead of south. The show rejoined Maimi as she arrived at Kouenji station, where she said she needed to turn. 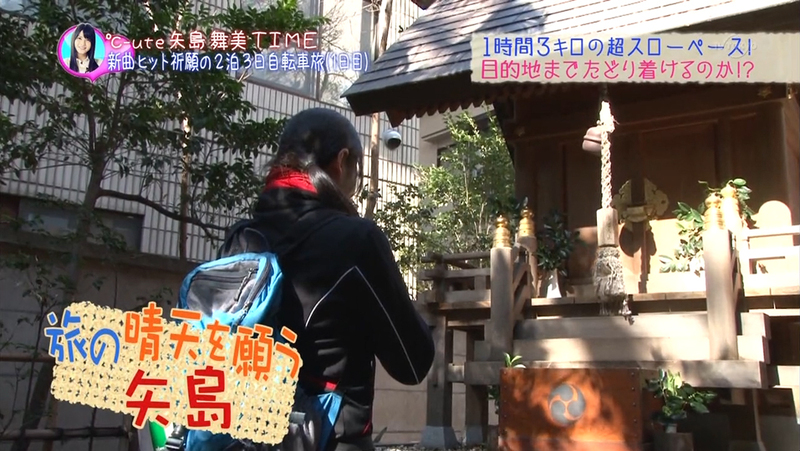 Maimi stopped and asked some strangers for directions to Hikawa shrine, who then kindly escorted her there. Once at the shrine, Maimi revealed that she went off the planned course to go to Hikawa shrine since the god of weather was there, and she wanted to pray for clear skies for her trip. Once back on course, Maimi was waiting at a traffic light when an old man approached her and complimented her on her bicycle. He asked Maimi how much the bike cost, to which she responded 300,000 yen (about 3,677 USD). That surprised the old man, who then asked her if she bought it herself. Maimi said that it was bought for a filming, which led to old man to ask her if she was a model. Maimi denied being a model however, and the two chatted for a little while longer before heading off when the light turned green. Five hours and 20km after starting her trip, Maimi became hungry. She chose a restaurant called “Rice Cafe”, and ordered the “demi mayonnaise omelette rice”. While eating, Maimi discussed her planned goal of reaching Enoshima by the end of the day, but after doing the math she finally realized how slow she had been going. With a full stomach and a faster pace, Maimi restarted her journey and eventually crossed over Maruko bridge, arriving in Kanagawa prefecture. Shortly after crossing the bridge however, the chain suddenly fell off Maimi’s bicycle, which brought her journey to a screeching halt and left us with a cliffhanger for next week’s episode. Fellow ℃-ute member Okai Chisato also appeared on this week’s “HaroPuro! TIME” with her own segment, where her and Hagiwara Mai introduced the game “Kimi wa Jitensha Watashi wa Mama Chari!” (You Ride Your Bicycle While I Ride My Granny Bike!). For the game, each member would pedal as fast as they could for 30 seconds on a stationary “granny bike”, and the member who pedals the fastest would receive sweets and their own segment on “HaroPuro! TIME”. Mai was the first to go and set the pace with 46.6km/h (about 29mph). None of the other girls were able to match the pace, but then the ringer Maimi came in and won it all with a pace of 51.8km/h (about 32mph). A salty Mai complained that Maimi robbed her of a chance at having “Hagi TIME” and that Maimi can have her own segment whenever she wants since she’s popular, but Maimi said that she’s the kind of girl who can only do things at full-power. Finally, Maimi received macaroons as the sweets reward. Posted on April 9, 2012, in Recaps and tagged Yajima Maimi. Bookmark the permalink. 2 Comments.